Takeaway: Marriage can be scary, and that is not necessarily bad if it makes you think before getting married. I have not read or watched Eat, Pray, Love. * Honestly, I just have not had much interest in it. But I was interested in this book. While I DO NOT think that everyone should get married, I do like to read about marriage and how to strengthen those marriages that do happen. 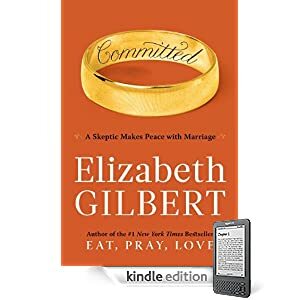 Gilbert starts with a very unsentimental take on marriage. She is broken and devastated over her divorce. She meets a guy equally negative on marriage after his divorce. And they live together with the stated commitment to never marry. At least until the American government gets involved. Because Gilbert is an American citizen and her ‘boyfriend’ is a Brazilian with an Australian passport (and an international import/export business) they move around frequently. But in 2006, the US government decided that the boyfriend had been visiting too often (which would be appropriate given a couple trying to live together). And in spite of the fact that they were following the suggestions of another Immigration official, he was apprehended at a border crossing, removed from the country after a long interrogation and told that he could never return to the US. Thus started a long journey for Gilbert and Felipe to try and get married (but not before given approval by US) and try to live together while Felipe was prevented from doing any business in the US (which had been his primary sales for the previous 20 years) and for Gilbert to come to terms with the thought of getting married again. The next third of the book is about Gilbert’s research into marriage. One of the interesting aspects given the blog discussion of Sacred Unions, Sacred Passions (about cross gender friendships) is that she recounts a social psychologist’s (Glass) findings about cross gender (non-marital friendship). Glass says affairs rarely happen when the ‘Walls and Windows’ of every healthy marriage remain in the right place. ‘Windows’ are the openings to the rest of the world in a relationship, all the ways that you interact with family, friends and the world outside your relationship. ‘Walls’ are barriers of trust behind which you guard the most intimate secrets of the relationship. What often happens (especially with new friendships) is that you start sharing secrets that belong inside the relationship. When those walls become windows, usually the windows with other healthy relationships started getting blocked up and become walls or your start building walls within the relationship. So by the time there is a noticeable attraction, or a crisis or some other spark, the previous change of walls and windows means that a person is now open for an affair in ways that they would not have dreamed. The final couple sections are more about her own preparations and fears. This is not a jump because she has always been a clear narrator. Throughout the book, Gilbert is clearly trying to talk herself into marriage. Sociology, ethnographic research, family background, economics, etc., all paint a complex picture of marriage. It is not all good. But the impulse toward marriage is strong for most, and even for Gilbert (although the US government is still wielding a lot of influence). The desire for life-long commitment I found stirring. From my understanding of Eat, Pray, Love, this is a very different book. This is not primarily a memoir or story about marriage. Primarily this is an non-fiction exploration of the concept of marriage that is told with her story as a framework. I think that many people have assumed this would be another story like Eat, Pray, Love and then been disappointed. I did not have those pre-conceived notions and really enjoyed it. *My sister in law after hearing that I had finished reading Committed without reading or watching Eat, Pray, Love made me watch the movie over the weekend. I liked it more than I thought I would.